I’m the first to arrive at Hadsham Farm, and Fi appears through an archway, beneath an exuberant pink-and-white rambling rose. ‘Hello!’ she says, and I grin. I’ve been looking forward to tonight: Hadsham’s a beautiful place and Fi’s always interesting – I’ve never once been bored listening to her. The other guests start to arrive the moment I’ve parked my bicycle, and we all start with a glass of ice-cold wine. I only know two of the other guests, but the rest are lovely; everyone’s smiling. I start to feel the stresses of an ordinary chase-around Thursday slide off my shoulders. There’s a big jug of home-made elderflower cordial on the table, and it smells gorgeous. An old-fashioned pump spills water down to a little trough, and we can hear the farm’s sheep in the distance. The evening sun is slanting through the willow, and we all agree that that the evening couldn’t be more perfect. Fi’s spent forever building up her gardens, and broadly speaking, they’re in five main sections arranged in a big backwards ‘C’ around the house. Directly in front of the house is the terrace, where we’re standing, and it falls away past a weeping willow to a lawn, bracketed by another big bed at the bottom. The lawn is protected from the valley beyond (the one I can see from the very top of Bramshill) by Leylandii, and there are odd gaps so we can see the splendid views. The third section is a sweep by the drive and the fourth is my favourite: the kitchen garden. The fifth is a lovely square outside the boot room door, and the place for hanging laundry and snatching quick handfuls of herbs for the cooking pot. The sweep beside the drive – Fi explaining Achillia, also known as ‘Soldiers’ Woundwort’. The tour is about to start, and we meander obediently after Fi, carrying our drinks, pointing things out to one another. Roses clamber everywhere, like inquisitive children, and I notice them in each of the gardens. I admire a massive trough beneath the kitchen window, planted with trailing red geraniums. We begin the tour at the sweep by the drive. Practically every plant is either medicinal or useful in some way, and we learn about cat mint (which looks like a cross between culinary mint and a nettle) and rue. There’s Rhodiola growing in the gravel beneath the shade of a tree, and Fi explains how it can be used by athletes to enhance mental and physical performance by increasing the oxygen in the blood. It also goes by the name Aaron’s Rod, which sounds rather dubious. We continue to the bottom of the lawn. ‘Anyone for Angelica seeds?’ asks Fi, and her eyes widen in surprise as we all shout yes. I love angelica; it looks like a souped-up cow parsley, or a less-thuggish hogweed. We look at horse-heal, burburis, digitalis. No medical herbalist is allowed to use fox gloves any more, its active ingredient is too variable in strength and impossible to measure without a lab. We move onto the serious big boys: Rheum, gelsenium. Fi mixes the latter with lobelia, so if anyone accidentally overdoses, they’ll be sick. 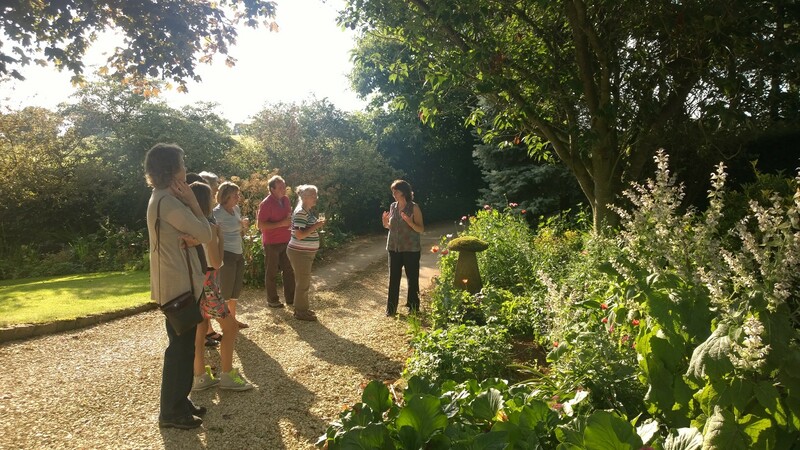 We start to move up back towards the house, Fi pauses to point out Vitex, a purple-flowered shrub talked about by Pliny-The-Elder in the days of the Roman Empire. Its alternative name is ‘chaste-berry’, and it’s used for lowering libido. I have an image of Aaron’s exhausted wife, crumbling the leaves into his supper. 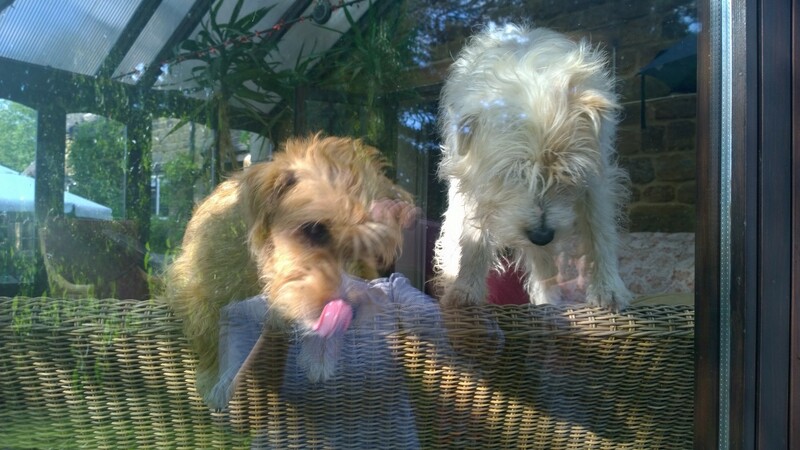 Two of Fi’s dogs are at the conservatory window, scrabbling madly for attention and clambering all over the back of the sofa. ‘Off!’ shouts Fi, to no effect. She shakes her head and leads us all through to my favourite bit, the kitchen garden. Here, everything is as perfectly McGregorish and neat and productive as you could wish it might be. Potatoes stand in perfect lines along their long ridges; sweetpeas gaggle up a twenty foot wide net; feverfew and borage flower in esoteric pattern alongside marching cabbages and neatly-staked tomatoes. A fork left for digging potatoes for supper – the amount of work that’s created this garden is evident whichever way you look. To the left, there’s a huge bank of raspberry canes, and there are two cages of strawberries. My daughters think of this garden as something akin to heaven. We listen to a bit on thyme, and its modern use in fighting super-bugs. No thyme leaf is exactly the same, so a bug can never change to become resistant to it. Fi is a great believer in the use of a plant as a whole, rather than extracting just one aspect of it. Happily, modern medicine is beginning to share similar thoughts. I admire the calendula blooming around my legs. Marigolds; bright orange and yellow, like sunshine caught on stalks. We move up the garden past the wall of sweetpeas to a tower of mallow. The pharmacy in a flower-bed. ‘A pharmacy in a flower bed,’ says Fi,pointing to the valerian. She tells us about wood bettany – good for those who’ve been ‘away with the fairies’. 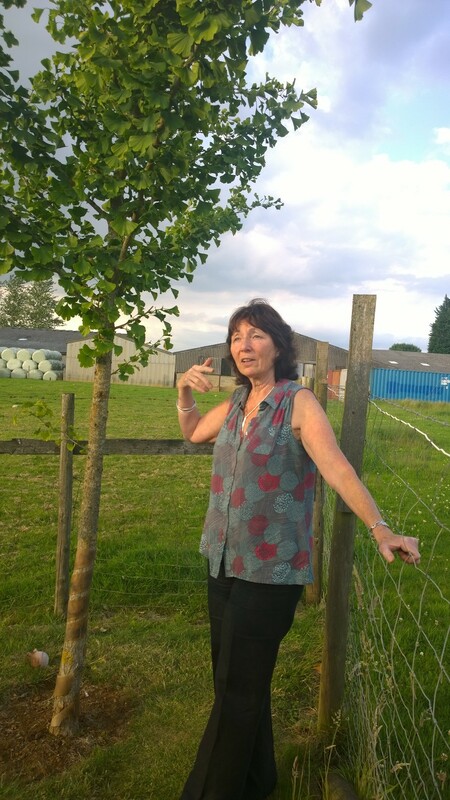 Fi has an strong interest in plants to treat dementia, and her sons bought her a Ginkgo tree for a birthday. It grows just outside the kitchen garden and is distinctive with its frilly-cape leaves. Ginkgo’s are known as ‘living fossils’; they date back 270 million years, and, fascinatingly, drop all of their leaves all at once. Next up is the boot room garden, and by now, I’m in a state of complete zen. The sun has dropped from the horizon, and I’m surrounded by beautiful, benevolent plants that smell like holiday memories, childhood memories – everything happy I can think of. I wander slowly at the back of the group, letting words and scents and gentle calm roll over me. I stand dreamily by a tall, gnarled rosemary and imagine how wonderful it must be to grow a garden full of food and medicine. I thank Fi and drift out to find my bicycle, clutching bottles of elderflower and lemon balm cordial. I take one more look at yet more roses, high against the wall of the house. Rose petals, hips, bark, all good for the heart, the soul. Rather like Fi herself. Beautifully described, Carlie, and sounds lovely. 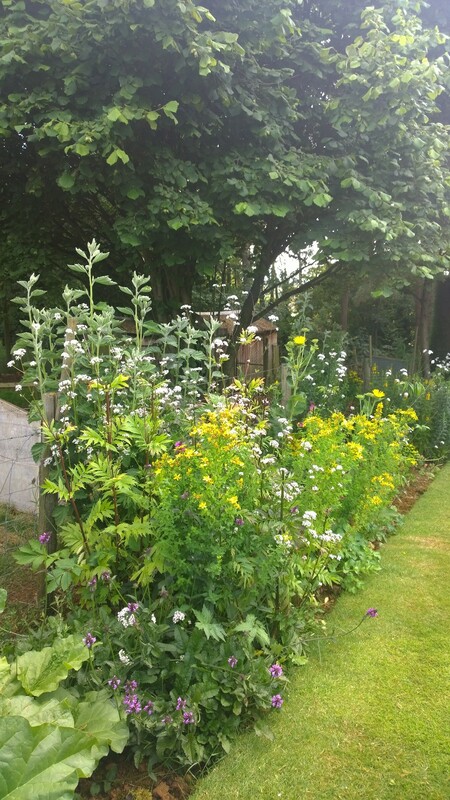 I also grow a lot of herbs and I love wildflowers, but rather lazy about putting them to use, apart from my sage, rosemary and lemon balm in a hot drink alternative to tea. 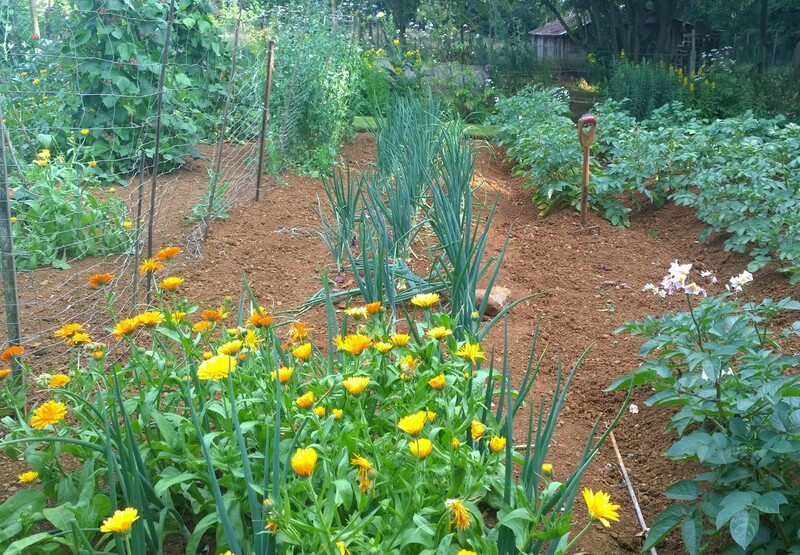 Enjoyed your photos also, good to see someone else growing marigolds among the vegetables. Hope your writing is going well. Hello Anne! Thank you for reading – it was such a lovely evening. One of the things Fi suggests that I find very useful is that the herbs and flowers should become part of your every-day living; thrown into dinners, or drinks, or bread or whatever, not just used as ‘medicine’ when we’re ill. Her whole thing is mind-full holistic well-being, avoiding being sick, rather than just treating the sickness when it comes. Such a clever lady – teaches me shed-loads every time I meet her.